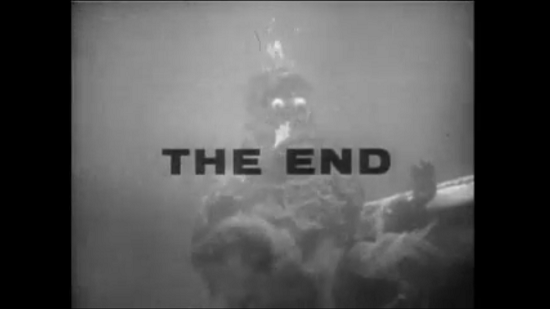 It wasn’t long ago -in my second-to-last article in fact- that I proclaimed my love for campy old monster movies. Really, I’m a huge fan of the “drive-in movie” regardless of whether they contain monsters or not. Creature features just seem to be the dominant sub-genre in this case. Any why wouldn’t they be? Cheesy monster movies just work better when you’re huddled up in your car, out in the blackness of the night. You’re much more vulnerable and secluded that at a theater or in the safety of your own home. Not that most of these movies were ever frightening, but the setting definitely added to the movies’ atmosphere. I don’t know for sure if the average drive-in screen is really bigger than your run-of-the-mill movie screen, but just by merit of it being out in the open, being forced to look up at it, it sure seems bigger. Maybe it’s because most of my drive-in experiences took place when I was about as tall as an Ewok. Anyway, whether it’s really bigger or not, putting a monster up on that big screen makes the monster seem bigger too, greatly enhancing the flavour of the film. Also, add a pinch of salt and a sprig of basil. Delicious! Not that I’ve ever had the true drive-in movie experience. By the time I was old enough to understand complex concepts like “movies” and “the drive-in,” the golden age of cinema was long over, and with it the drive-in movie. By that point they didn’t make (nevermind show) movies like Phantom From Space or War of the Worlds anymore. No, when I went to the drive-in, I got to see stuff like Batman Forever and The Phantom. That said, going to the drive-in was definitely more about the experience than the movies for me. Considering the above facts, I have no idea why I get nostalgia tickles for classic drive-in movies. They were never a part of my life, but I have consumed plenty of media depicting classic drive-ins. Is it one of those false memories? Can nostalgia be faked? If so, is it something I can use for profit? Anyway, our local drive in has been closed for a few years now, so all I have are my memories. Mostly they’re memories of the commercials urging patrons to go spend copious amounts of money on mediocre snacks over in the projection building/snack shop/bathroom/whatever it’s called. My parents always brought a buttload of snacks along so that they didn’t have to shell out for the overpriced on-site stuff. I think everyone did, and that’s why the drive-in is no longer open. I’m very nearly to 500 words here and I haven’t even typed the title of the movie I intended to “review” here. 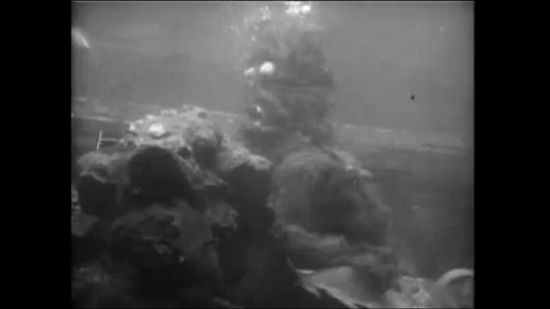 Creature From the Haunted Sea. There. Let’s hop to it. 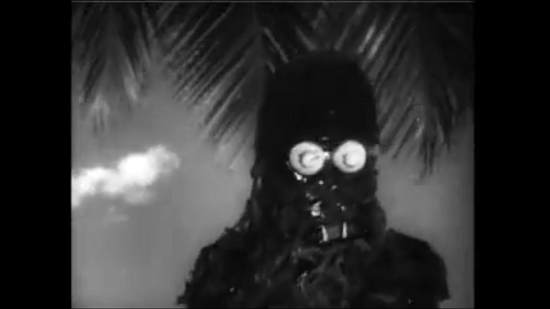 Creature From the Haunted Sea is a Roger Corman movie from 1961. 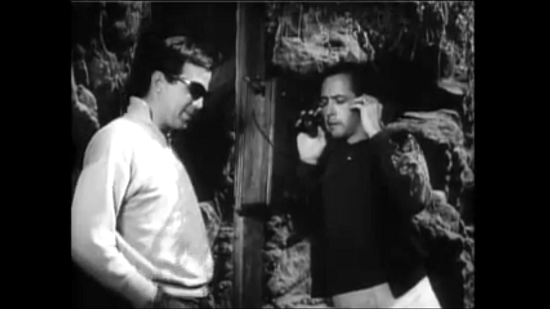 If you know the name Roger Corman, you’re probably into low-budget horror/sci-fi movies. Like me. That or you’re into movies in general and are over 40. Unlike me. If you don’t know who Roger Corman is, the most contemporary piece of information you need to know is that he is partly responsible for Sharktopus, and for that, he deserves a 50-foot solid gold commemorative statue. Or at a least a 50-foot solid chocolate bunny. 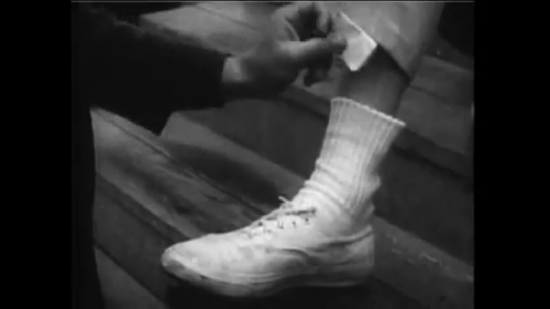 This particular movie opens to a man getting his shoes shined, and a little something stuffed in his sock. Then there’s a bang and the shoe shiner is dead. This leads into the world’s shortest chase sequence, wherein the chasee runs down an alley, climbs up a ladder and disappears into a doorway. The chasers see him duck into the doorway, and split up to cover both sides of the building. Once they’re gone, the so-far-nameless man pops back out the doorway, climbs back down the ladder, and is off on his merry way. Wow. But then again I suppose that henchmen are supposed to be dumb. The little thing the shoe-shiner placed in the man’s sock turns out to be a note. A note with the messy scribbles you see above. So the man who must be our hero munches the note (because that’s the obvious course of action), dons a rather brilliant disguise, and heads off to Santo Domingo Bar. To do what? I’m not sure yet. Dialogue has been more than a little sparse in these first three minutes. From here, we get a little… well, okay, it’s still a while before we get to any real plot details. For the moment, we get to watch a somewhat uncomfortable scene between our hero (Agent XK150) and his lady-type contact, Agent XK120. Now 150 is the kind of man who thinks that every woman is in love with him, and as they maybe sort of talk about the plot perhaps, there’s also some strange, completely abstruse chess innuendo going on. It’s a completely ridiculous scene that will most definitely leave you wondering if you should bother to watch the rest of the movie. 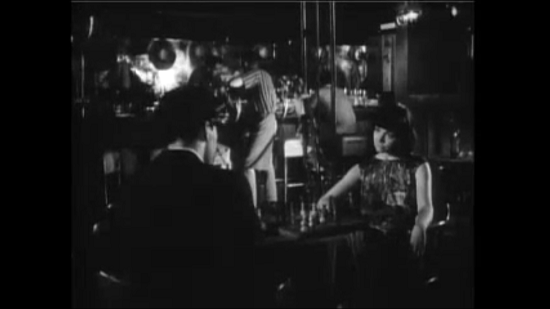 Fortunately, XK150 trips on the stairs as he tries to leave the bar nonchalantly. It’s not as funny as it should be because it’s a terribly fake trip, but it’s something. I guess. From there we see the title card (pictured above) and move on to watch a short mise-en-scène that gives us the little details about what’s been going on in the movie’s world up until now. 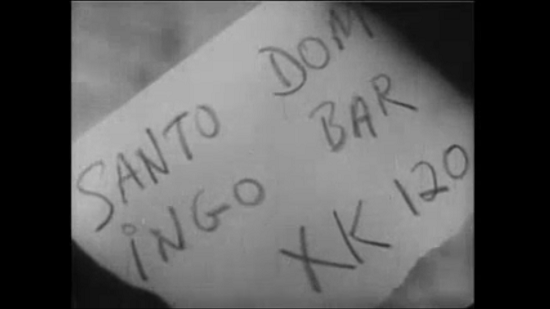 Turns out that the film is set in Cuba (hence the Santo Domingo Bar) after a revolution brings down the old communist regime. There are, of course, a handful of Cuban nationalists who prefer things the old, communist way. And really, who can blame them? Communism isn’t a good way, but it’s all they knew. Anyway, somewhere in the social turmoil the nationalists ended up getting their hands on the Cuban national treasure, which I guess is probably gold bars and other standard treasurey stuff. I prefer to imagine that it’s a bunch of magical parrots that fart sugar or something. I would be remiss to omit that the exposition is preceded by a credit roll featuring a bunch of little cartoons of Cubans riding around in clown cars and… well, it’s a monster. Whether it’s our monster or not, we haven’t a clue. 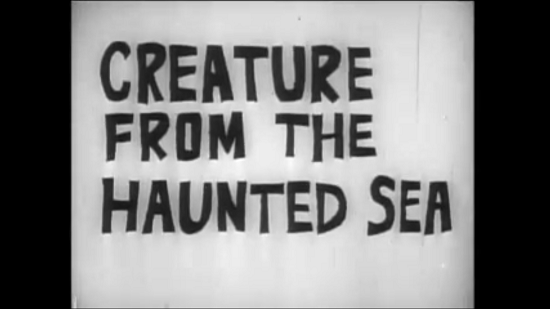 Aside from the fact that the film is titled Creature From the Haunted Sea, there’s been nary a mention of any creatures, beasts, or monsters. But they wouldn’t just draw a random monster to slap onscreen during some exposition, would they? Nah. I can’t wait to see this bad boy in live action! He’s gonna look awesome. 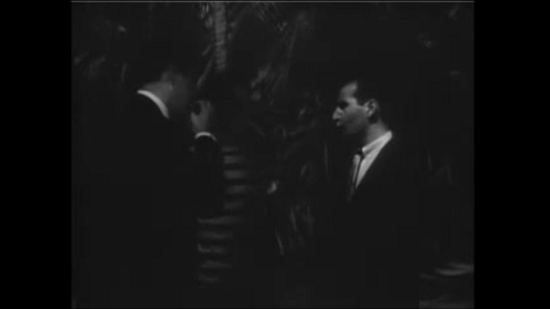 We move on to see a short scene with some criminals negotiating with some Cubans about some treasure. The crooks are on tap to help the Cubans smuggle themselves and treasure off the island, with the crooks getting the promise of a slice of that tasty, tasty treasure pie once they’re in the clear. That seems like a pretty good deal for me. Helping the nice Cubans, even though they’re communists, and having a sweet payday when all is said and done. They don’t seem like crooks to me. They’re just good samaritians. Or maybe I forgot that we don’t really know they’re crooks yet. Oops. Spoilers. This is where we learn all about our main characters. It’s also where our suspicions are confirmed that this movie is part comedy. Oh, you hadn’t guessed? Well it certainly explains the painful bar scene. That bar scene wasn’t funny, but at least now we have an idea what they were trying to do there. 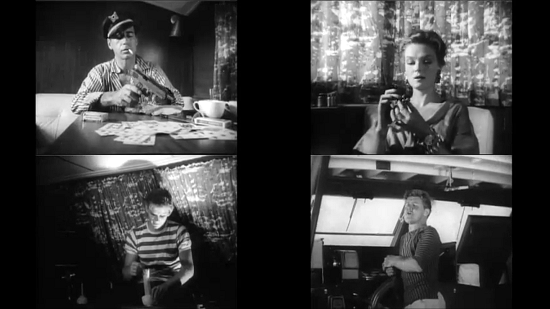 The four criminals on board are as follows: the leader Renzo Capetto, his girlfriend Mary-Belle Monahan, her brother Happy Jack Monahan, and all-around oddball Pete Perterson Jr. There are so many things I could say about this scene, but if I tried to type them all out this paragraph would get really, really big and difficult to follow. Like, even more difficult to follow than my usual writing. So I’ll take my chances on this single tidbit: The actor who plays Pete is named Beach Dickerson. Yeah. Just let that one settle for a minute. What the Hell, 1950’s? How did people end up with names like this? 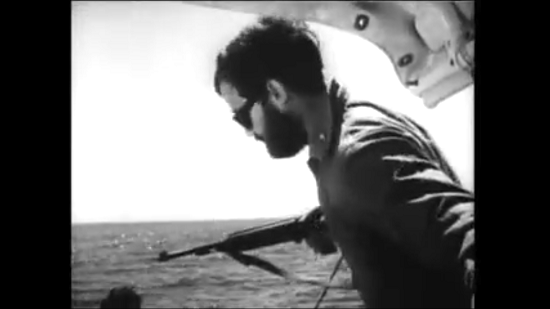 Agent XK150, on the other hand, is undercover in the smugglers’ boat and going under the alias Sparks Moran. Now that, that is an awesome name. I am going to fight to name my son Sparks Moran, and if I can’t win that battle I’ll get a hamster and name it Sparks Moran. Because Sparks Moran is too good a name not to name something. You see what I mean about my writing being hard to follow? There’s a fairly long sequence where not much happens, save we learn that everyone on the boat except Renzo and Mary-Belle are complete and total nincompoops. Even those two aren’t the swiftest, but stacked up in line with everyone else on the boat, they could pass as geniuses. Sparks Moran isn’t the most brilliant dude in the Bureau either. Or, some government agency, anyway. It’s never said exactly which one he works for. The fact is that the guy is great with pseudonyms but is otherwise more of a Sparks Moron. Yuk yuk yuk. Okay okay. That one was really bad, but not nearly as awful as some of the one-liners and wisecracks in the movie proper. Eventually it’s revealed that Renzo is plotting to off the Cubans and take all the treasure for himself. Shock! And here I was calling this man a good samaritan. It’s now perfectly clear that Renzo Capetto is a Bad Dude, and not in that “save the president” kind of way. What he does next -and it’s the most roundabout way of meeting his needs- is grab a few rakes and a plunger and has Jack slice up one of the Cubans while nobody else is around. But wait! Something else has come aboard! And it’s also slicing up one of the Cubans!! What… what is that thing? I didn’t really get a good look at it, was it some kind of hideous black blob? With googly eyes? Was that our monster? No, couldn’t be. 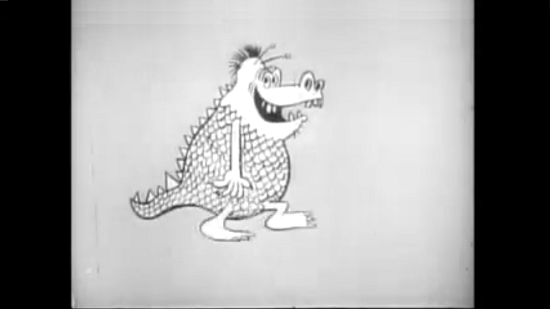 Our monster was way cooler and friendlier-looking than that… “thing” was. Also, our monster wasn’t Cookie Monster with fangs. Back inside the boat, General Tostada is making a big fuss about how two of his bestestist men have mysteriously been hacked to pieces. 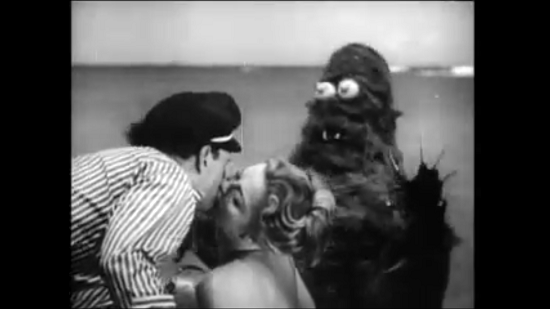 Renzo bodly claims that it musta been a su-su-su-sea monster, and when the Cubans accept this without second thought and leave, he gives Pete and Jack the bidness for killing two dudes instead of just one dude like they were told. Pete becomes very confused by the concept of “numbers” and everybody just drops the issue of the second dead dude and goes about their regular business. Now that I’ve gotten myself all drooly for Mexican cuisine, it’s going to be a lot harder to focus on trying to be funny. You’ll have to forgive me if the rest of this review is played too straight and bores you to death. Anyway, blabbity blah, something about needing to land the vessel because of the coast guard? Somebody shot somebody else I think. Sparks managed to mess up the fish-slapping dance in there somewhere. Also Mary-Belle may have tried to distract the coast guard with a song. I’m still too distracted by the hunger pangs and that not-monster to remember what was going on in the movie at this point. What? You thought I was writing while watching it to keep my stuff accurate? Oh you naive little goose, you. This review is to entertain, not to inform! So in some roundabout way, the crew goes ashore, but not without first dumping the treasure into the reef so that it won’t be found should anyone else accost them. Renzo’s Big Plan is to off the rest of the Cubans while they’re on-island and then pull up the treasure and vamoose. Except once they hit the shore everyone runs off in different directions. Sparks Moran happens across a payphone (really?) and his call to home base is interrupted by some random fellow. The scene is strange but funny, and was apparently not included on the version screened in theaters. I bet every last DVD copy includes it, so you’ll have to fast-forward if you need the authentic experience. You dirty hipster. Pete, on the other hand, traipses off into the jungle and comes across a rather large woman named Rosina who appears to be native to the island. She also has an affinity for making animal noises -that’s Pete’s thing, BTW- and they are instantly smitten. Eventualy she introduces Happy Jack to her daughter Mango. Not two minutes after meeting Mango, Jack quite seriously declares his intent to take her home and marry her. Boy, things sure were simpler back then. Soon after, we learn (via subtitles) that she’s just a hussy who seduces stupid white boys to get them to buy her crappy knick-knacks. It seems that trouble has followed the crew to the beach though. Renzo leads his boys and a buncha Cubans on a diving expedition to see if they can locate the treasure box they had dumped into the sea. 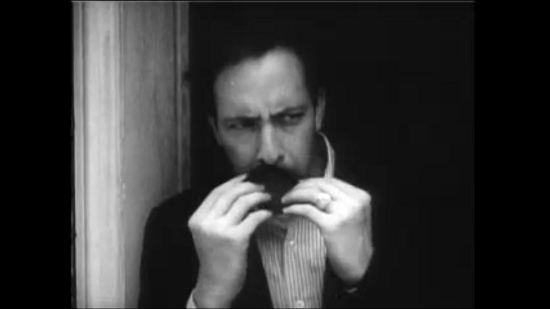 Of course, this is mostly a ruse so that Renzo can carve up some more Cubans without arousing suspicion. The two new vics wash up on the beach and Renzo manages to convince the remaining Cubans that it was the monster yet again. The crew’s Cuban supply is quickly dwindling. Sparks hitting on Mary-Belle has been another running “gag” that I’ve very masterfully avoided mentioning until here. Sparks is convinced that Mary-Belle is hot for him and that she’s just playing hard-to-get, but the opposite couldn’t be more true. Even the most deluded individual should be able to recognize the “Get away from me, geek” look that Mary-Belle constantly wears whenever Sparks is around. Around this point all the characters spend a good ten minutes standing around doing nothing, the only important thing to note being that another woman is shoehorned in and immediately gets a lady hard-on for Sparks, presumably so that the “hero” can get the girl in the end without compromising the integrity of any other characters. Can’t really get around it now. At this point in the flick, it’s gonna be pretty unlikely that a new, better monster will show up. I’d be lying if I said I was totally disappointed that the monster isn’t even close to the one in the opening exposition sequence. I mean, just look at that thing. It’s simultaneously so bad that it’s hilarious and the stuff that nightmares are made of. I don’t know if there’s a formula for striking that perfect balance, but I can’t think of anything offhand that’s so goofy-looking while also ensuring that I need a night-light. I don’t know. 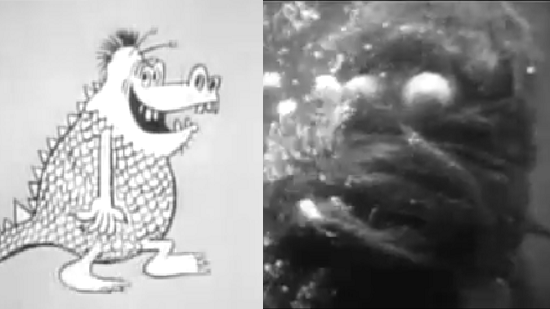 While they’re both pretty goofy, I don’t think the cartoon monster could inspire fear in an audience. Yeah, he’s huge and monster-lookin’, but he also looks like he’s got a pretty jolly demeanor. He probably wouldn’t want to scare anybody anyway. Whereas our real Creature has no beef with slicing dudes to ribbons. If you do a little research on this movie (and I did), you might come across a quote or two from some choice cast members claiming that they had a hard time containing their laughter whenever they saw Creature. Antony Carbone (Renzo) apparently even suggested to Roger Corman that all of Creature’s scenes should be shot from its point of view, so that the audience didn’t laugh out loud as soon as they saw the ridiculous thing. And yeah, it’s ridiculous, but I don’t think I’d enjoy this movie nearly as much without it. On the other side of the beach, Pete and Happy Jack and Rosina and Mango are all having a jolly good tickle fight in the water. Ruh-roh, Raggy. 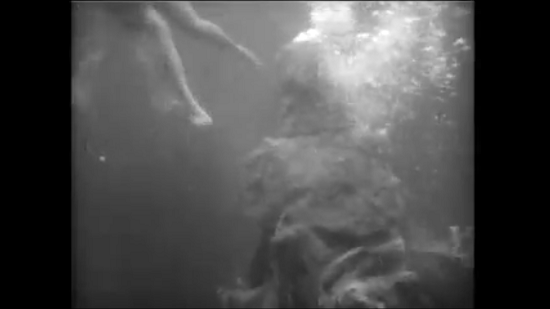 Swimming and splashing jovially is never a good idea in a movie about a sea monster. Or any murderous beast, really. What does manage to be surprising about this scene is that Creature only takes Mango. I suppose you don’t really see Mango die so maybe Creature had other plans for her, but he doesn’t seem to eat his victims, so why not get all four of ’em? If you’re just in it for the kills, might as well boost your tally as high as you can. Whatever. No point questioning monster logic. Happy Jack takes it hard, and since nobody has caught on that there’s a real monster yet, he accuses Renzo of murdering Mango. Now that I think about it, maybe the monster is killing because he feels so neglected. All of these people are just chillin’ on their fun party boat and denying his existence. Poor Creature was probably neglected by his parents and ignored at school, and now he’s taking out his anger on the society that shunned him. It’s not really a healthy way to deal with your baggage, but then he is a gigantic, disgusting beast. I think the basic plot of the story is pretty clear at this point, and I don’t care enough to watch the movie again just yet (it’s a once-in-a-while flick) to refresh my memory of exactly what goes down next, so let’s pop over to the climax, yeah? Aboard the boat, Renzo is congratulating himself on almost being rid of the Cubans, when we suddenly see Creature slowly approach the boat. Sparks and his lady friend are the only people inside the movie who can see it though, and hightail it in the boat’s dinghy. Renzo and Mary-Belle are too busy gazing into each others’ eyes to notice Sparks making like a tree, but I can’t for the life of me understand why nobody else noticed him leafing as fast as he could. Oh, maybe it’s because they were too busy being eaten by Creature, who pounced on Mary-Belle and then ruined everyone else’s sh- err, day. Sparks boats off into the proverbial sunset with his new honey bunny and does the whole ending monologue thing that narrating characters are wont to do. 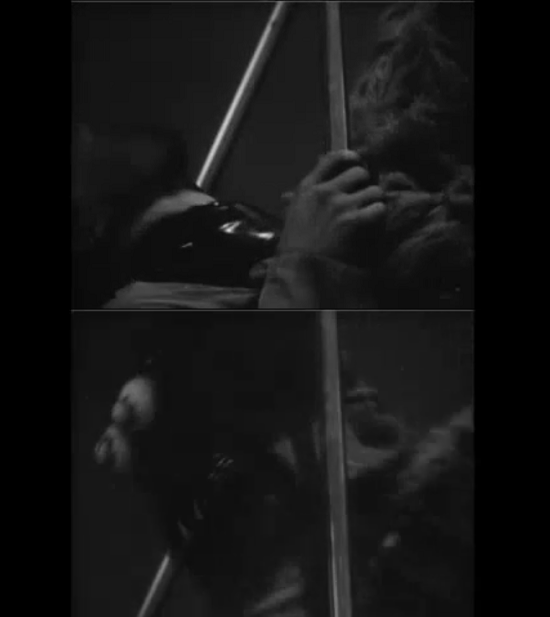 All that, and we’re left with a short shot of Creature brushing his fur with one of Renzo’s murder-rakes. Sparks also implies that it lived very happily with the big box of sunken treasure. What good it does him, we may never know. Perhaps sea monsters consider gold a delicacy?